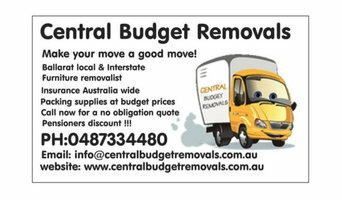 The Team at Central Budget Removals are focussed on delivering your valuables promptly and safely. Our service aims to help you get the job done quicker – so that you can concentrate on enjoying the important things in life. Find companies in Ballarat, Victoria that provide storage or moving services on Houzz. Scroll through this page to find a home removalist storage solution in your area. Just enter your suburb at the top of this page to narrow your search. Get contact information or message professionals directly so you can ask about rates, and read customer reviews.